The Norton NRS 588 - or 'rotary' Norton racer - was the brainchild of engineer Brian Crighton. His innovative project was at first rejected by Norton management. Crighton threw the bike together, anyway - in the caretaker's shed! Subsequently, it performed so well in speed tests that Norton's top brass had a change of heart. They gave the green light for the bike's development. Riders Trevor Nation and Steve Spray were joined at the hip with the 'JPS Norton'. Their immaculate leathers - black, silver and gold - were an iconic sight at British circuits. They blended in beautifully with a bike guaranteed to make misty-eyed any seasoned spectator of the time. Top racer 'Rocket Ron' Haslam also played a pivotal part in the bike's success. Revered for its jet-like straight-line speed, the rotary's engine braking - or lack of it - made cornering more of a challenge! This could be the source of considerable mirth ... so long as no-one was seriously injured! 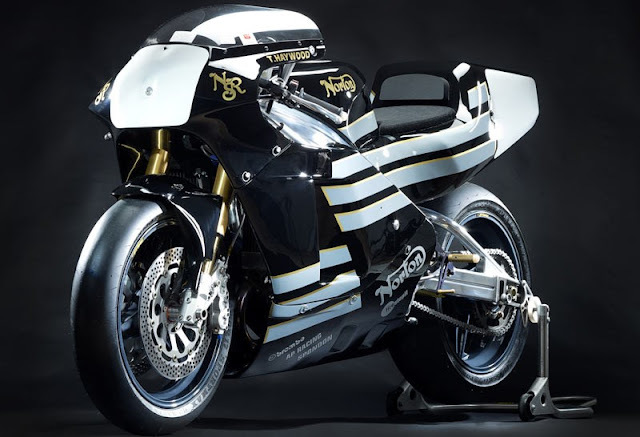 The Norton NRS 588, then, was an iconic race-bike. All thanks to Brian Crighton, and his powers of perseverance ... and self-belief!